Just as with most areas of my life, I try to find the green route...greener options, greener choices, you name it. Postpartum and newborn care are no different. So today I will share some of my favorite ways tho go green when it comes to caring for your postpartum journey and for taking care of your newborn baby. 1. Breastfeed. Aside from being the best food for your baby, breastfeeding is also a great way to go green in how you avoid all the waste, packaging, and production involved in using infant formula. Granted, if you have a health condition or for some reason cannot breastfeed, then this tip is not for you and that's okay...there's plenty of other ways to go green. But if you are on the fence, I'd highly recommend it. I breastfed Avery throughout my pregnancy with Mila, and continue to tandem breastfeed her now. I'm sure that seems kind of crazy to some of you, and even to me sometimes I'll look down and be like, "Wow, I'm tandem breastfeeding, never thought I'd be doing that...but here I am!" Really though, it's not that bad. 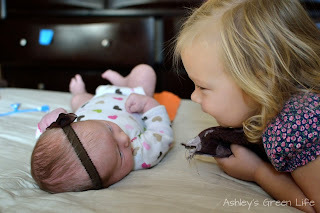 For starters, I love knowing that Avery is continuing to get extra nutrition from the breast milk, and it has been helpful for coping with the changes of having a new sibling. So instead of breastfeeding just being something that Mila and I do, it continues to be a chance for me to bond and connect with Avery, something that's much needed during these crazy days as we adjust to being a family of four. You can read more in this post about some of the benefits of extended breastfeeding and how helpful it is not only for toddlers, but also for moms too. So, in the long run I think that breastfeeding is one of the best ways you can go green! There's no warming, no containers, no trash, just good ol' breast milk! 2. Glass baby bottles. Now in a few weeks, I'll be going back to work, and at that time I will be pumping for Mila, you can read more about my pumping routine in this post. One way that I try to "green up" this routine is to use a glass baby bottle instead of plastic. 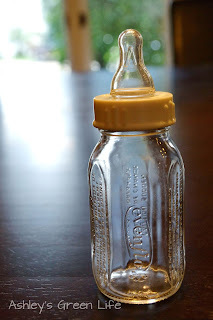 Now there are lots of baby bottles on the market these days that claim to be BPA and phthalate-free, but for me I'm still a little bit phobic of plastic, so I stick with glass. I love Evenflo's Classic Glass Baby Bottles, which cost about $6 for 3 bottles. I had about 6 bottles with Avery, 3 in the big size, 3 in the small size and now I'm able to use them with Mila. Most plastic baby bottles get scratched or start to fade after just a few months, thus leaving you to throw them away and buy more. But with glass they clean, sparkly, and just as sturdy for years. 3. 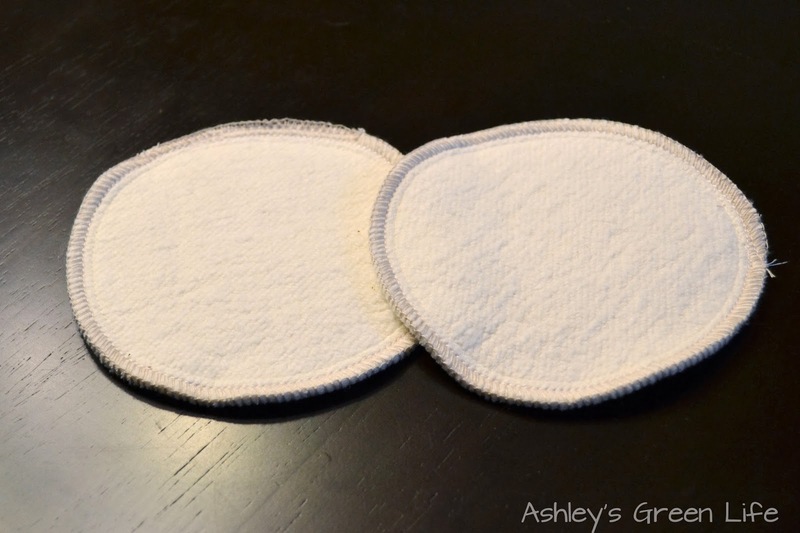 Cloth nursing pads. It didn't take me long once Avery was born to realize that when I was breastfeeding her that the milk came out of BOTH sides, not just the side the baby was on...who knew right?! ( : Anyways, to catch the flow from the other side or occasionally even the side the baby is on, I use cloth nursing pads. I use, "Heavenly Nursing Pads" from the website, Mommy & Me Creations. Avery calls them my "milk pads" and is quite the helper in helping me to keep track to them, as she is always picking them up from around the house and telling me, "Don't forget your milk pads!" These milk pads are about 5 inches in diameter and are made with organic hemp fleece. A set of two pads costs $4. Basically I stick them in my nursing bra or nursing tank top and they absorb the flow as needed. Then when I'm done with them, I throw them in my laundry and they are clean and ready to go again. In the early days and weeks, I probably go through a 2-5 pads a day. These are the same pads that I used with Avery and it's so nice to get a chance to use them again instead of having to buy new ones. Now there are all kinds of cloth nursing pads you can find out there either on Etsy or Amazon, so anything you can find that's reusable, instead of disposable (as most nursing pads are) is a step in the "green direction". 4. Use cloth diapers. 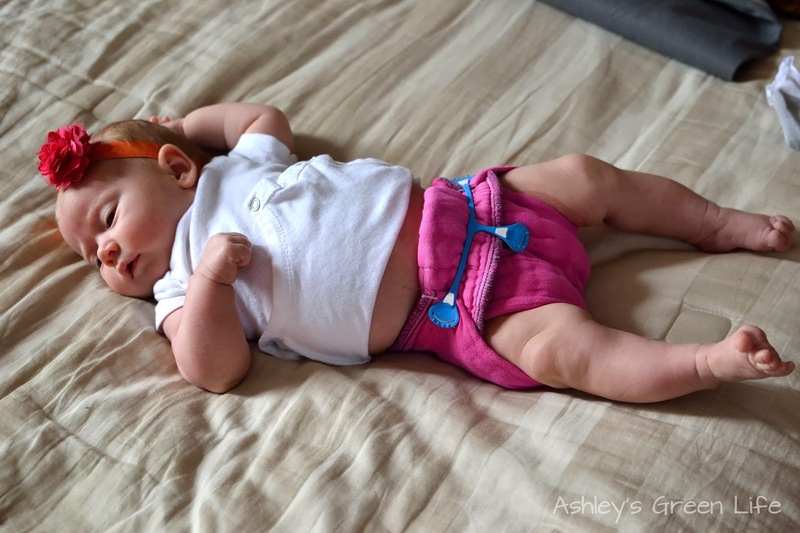 From the time that Avery was born, we've used cloth diaper service to help us go green with our diapering and it has been great! As you can imagine, cloth diapers are a greener option compared to traditional disposable diapers because there is no waste so nothing goes to the landfill. Now although cloth diapers are a bit more expensive than disposables, (it costs about $20 a week for our service), it's well worth it for us to avoid the trash involved with disposables and I think the cloth fabric is more gentle on little baby bums as well. We use a local company here in Kansas City called, Metro Cloth Diapering. They provide us with a cloth diaper insert, a diaper cover, a Snappi that holds it all together and even cloth wipes. So when Mila has a dirty diaper, we place it in a "wet bag" along with all her other dirty diapers, and a few from Avery who still wears one at night, and then once a week the "dirty bag" gets picked up. Along with it, new diapers get dropped off..that are clean! The best part about it is that I didn't have to clean them! Kudos to you parents out there who wash your own cloth diapers. You are brave and I applaud your "green-ness!" But for us, using a service is the best option for us to go green in the line of diapers. 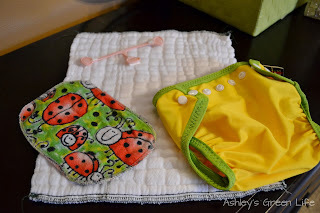 You can see more pictures of steps involved in cloth diapering from this post with Avery. Mila rocking her pink cloth diaper. and we are in charge of washing these...which I can handle! Good thing I've got this little helper to assist me in diaper changes! 5. Cloth pads for postpartum flow. Another lovely fact of life I learned after Avery was born was that after you have a baby, you bleed (as if you are having a period, but stronger). Hello to that! So to catch the flow you will need pads of some kind. 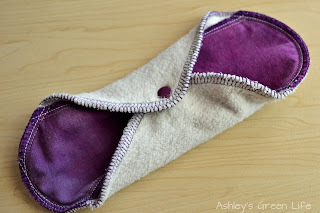 But as I stated before, we're going to look to reusable options in our quest to go green instead of disposable, so in come cloth pads. I use a pad from the same company I mentioned above, Mommy & Me Creations called, "Heavenly Cloth Menstrual Pads." I purchased the set of six, 9 inch pads including inserts for $45. In those first few days after birth, I went through 2-3 a day so I had to keep up on my laundry, but really it wasn't too hard to do and I loved knowing that I didn't have to buy any disposable pads or even any new cloth pads since these were the same ones I used after Avery was born and occasionally during my periods. Find other ways I go green with my period in this post. Now just with the cloth nursing pads, there are all kinds of cloth menstrual pads out there on Etsy and Amazon, so shop around. Feel free to share any favorites that you may have below! 6. Keep baby products simple and "green". 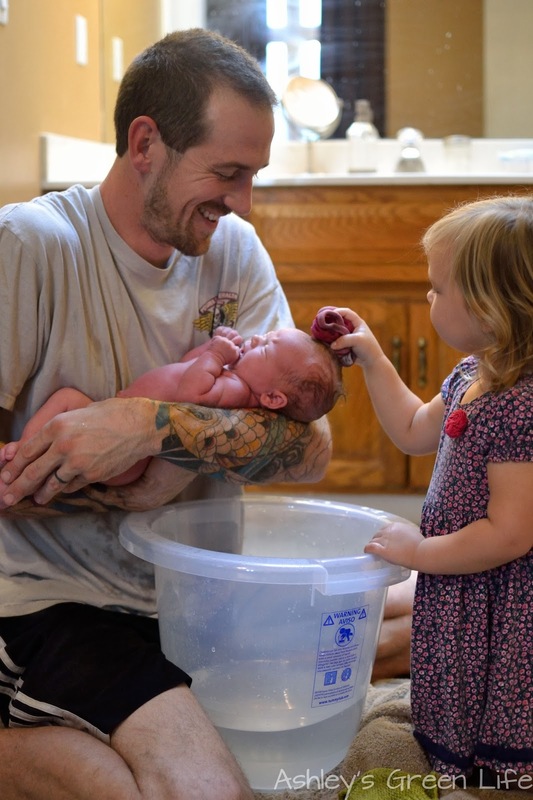 It can be very overwhelming for new parents to think that they need all kinds of personal care products to keep their baby clean and healthy, but I keep it simple and only use two products, both of which, our whole family uses. 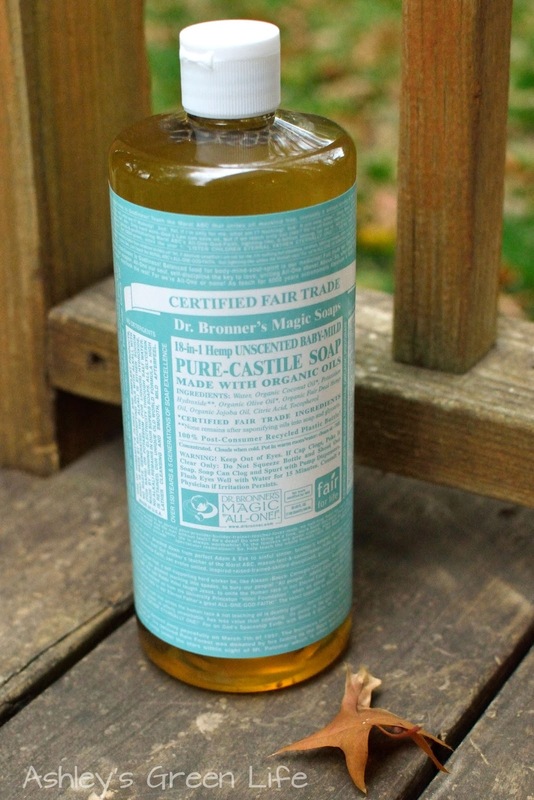 First up is Dr. Bronner's Baby Mild Castile Soap. I've blogged about this awesome green soap in the past, and it is still my go-to especially now that Mila is here. So when we give Mila a bath in our favorite baby bathtub, the Tummy Tub, we just add a little bit of this soap and it gets her nice and clean...minus the toxic ingredients of traditional soaps. 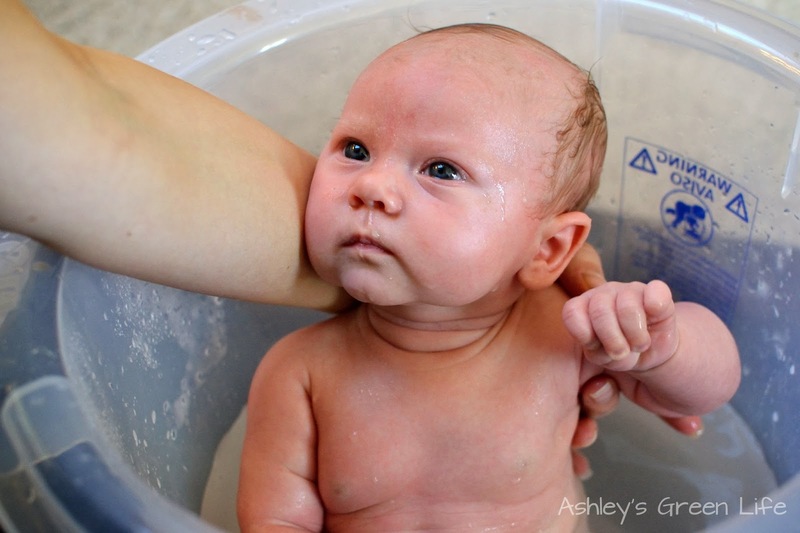 Here's more reasons why we love the Tummy Tub too in this post! "You're using Dr. Bronner's right Mom?" 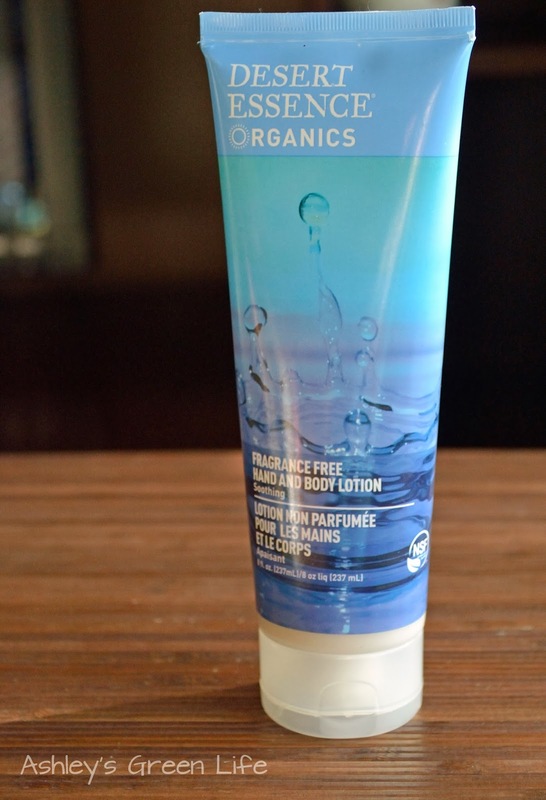 The second product I use with Mila is Desert Essence Organics Fragrance-Free Hand & Body Lotion. This is the lotion that I use, as well as the rest of our family. I find that it works great if Mila has any dry skin or just needs a little moisturizing. 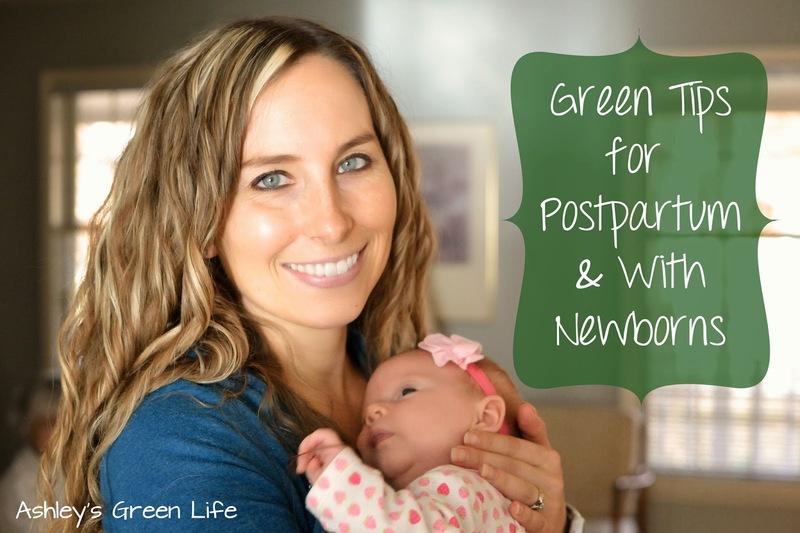 So there you have it, my top six tips on going green during postpartum and with newborns! Do you have any others to share or any favorite brands of green baby products? If so, share them below! Here's to green mommies and babies!